Metazene™ (niacinamide) Gel 2 oz. Suggested Use: 1-4 capsules daily in divided doses or as directed by a health care professional. Potassium is an essential mineral throughout the biological world. Orotate is a raw material that the body uses to make DNA. Potassium helps to regulate the amounts of water and electrolytes in cells and plays an important role in nerve conduction and muscle contraction. The Institute of Medicine recommends that adults consume at least 4,700 mg/day of potassium. But most Americans and Europeans consume far less than that. blood circulation and muscular strength. Potassium orotate is a mineral salt that is normally found in small amounts in all living things. Each molecule of potassium orotate consists of a molecule of orotic acid in which one of the hydrogen atoms is replaced by a potassium atom. Disorders and symptoms linked to potassium deficiency include:2,3 diarrhea, increased urination, vomiting, muscle weakness, paralytic ileus, cardiovascular and heartbeat abnormalities, decreased reflex response, respiratory paralysis, growth retardation, diabetes and insulin resistance, and rheumatoid arthritis. In the U.S. and some other industrialized countries, government agencies like the U.S. Food and Drug Administration have adopted censorship as a method for intensifying their control over supplement users and their suppliers. Thus, FDA regulations prohibit us from telling you that any of our products are effective as medical treatments, even if they are, in fact, effective. Accordingly, we will limit our discussion of potassium orotate to a brief summary of relevant research, and let you draw your own conclusions about what medical conditions it may be effective in treating. Hans Nieper was a controversial figure whose treatments were denounced by many in the medical profession and were targeted by the U.S. Food and Drug Administration — despite the fact that these critics had done essentially no investigation of these treatments, and despite the fact that countless thousands of Nieper’s patients and followers found the treatments to be superbly effective.6 Nieper died in 1998, but his influence lives on. Other researchers have also studied some of the medical applications of potassium ororate. Let’s look briefly at these applications. Structures in the inner ear, known as the ‘vestibular apparatus’, enable us to keep our balance and sense of orientation as we move around. Dysfunctions of the vestibular apparatus can cause dizziness, disorientation, and nausea. In a Russian experiment, volunteers with a low vestibular tolerance were exposed to ‘coriolis’ motions that disrupted vestibular function. 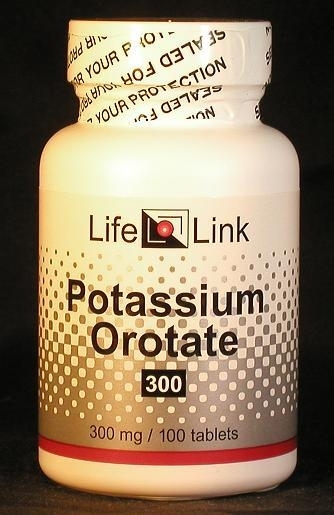 Potassium orotate (40 mg/kg-bodyweight/day during 12-14 days) “significantly increased statokinetic tolerance and produced a protective effect on the central nervous function against Coriolis acceleration” as assessed by EEG, short-term memory, and mental performance.12 In other words, this supplement may be helpful for people who suffer bouts of dizziness and disorientation. Are potassium orotate supplements useful for the conditions and purposes mentioned above? We aren’t allowed to tell you, so you should take a look at some of the references cited here, and then decide for yourself.